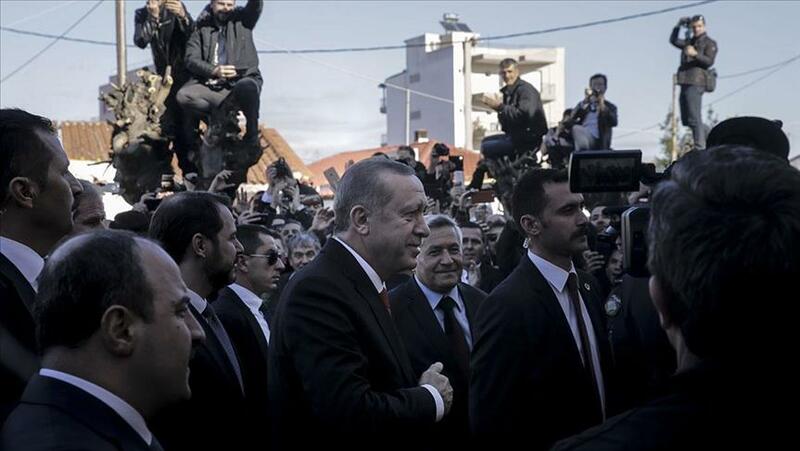 On day two of a landmark trip to Greece, Turkey's president on Friday is visiting a large population of Muslim Turks. After landing at Alexandroupoli airport, Recep Tayyip Erdogan went by car to Komotini, a major city in the Western Thrace region. He did Friday prayers at Komotini's Kir Mahalle Mosque. Greece's Western Thrace region is home to a Muslim-Turkish minority of around 150,000 people. Erdogan is being accompanied by a delegation of top officials, including Deputy Prime Minister Hakan Cavusoglu, Foreign Minister Mevlut Cavusoglu, EU Minister Omer Celik, Justice Minister Abdulhamit Gul, Interior Minister Suleyman Soylu, Chief of General Staff Gen. Hulusi Akar, and Energy Minister Berat Albayrak. Also accompanying the president are Greece's Alternate Foreign Minister Georgios Katrougalos and Deputy Foreign Minister Ioannis Amanatidis. Erdogan visited the capital Athens on Thursday, meeting with his Greek counterpart Prokopis Pavlopoulos and Prime Minister Alexis Tsipras.